This topic contains 3 replies, has 3 voices, and was last updated by skolb32 5 days, 20 hours ago. man, nobody believs me, they dont understand tht im still alive. 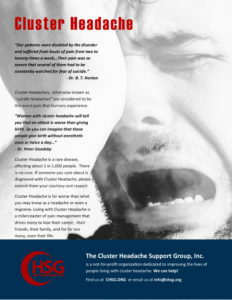 i think i might ne the worst case of abuse of a clusterheadache surviver, wondr if anyone else has had this happen to them. been waching videos on youtube of attacks people are posting, i have re traumitized to a point where i cannot function anymore, i used to be proud that i made it this far but without lov and support, theres only one way out. i noticd on those videos right away the differnece between them, you and me. they all have someone who loves them and support them. ive been at this since i was twelve and was labelled a liar and drug seeker by my doctor. so my family has never supported me. in 2006 my family left me for dead at the hospital, i was still undiagnosed, in hospital they shot me up with 5 mg of morophine and i would pass out instantly for 3-4 hours. on the fourth morning i woke to a nurse crying two white oats and a lawyer trying to solve thier legal matter about me. see when the nurse started her shift, she couldnt find my pulse or my breathe and they figured i would die. by the grace of god i woke up, then another 3 days of beeing shot up. i dont remember musch from this experience….i know tht no one came to save me cause my mentaly ill sister told everyone i was haveing a mental breakdown, cause they dont know my pain is real. they still dont. i went 24 years without a diagnoses and was refused help every time i went to hopital, my family doctor would turn his back on me when i would go there……. so i am at a point where ive been chronic for 6 years now and bankrupt , lost my business and cant ask for help cause last time i ask a family member to get me an oxygen tank(40 buks) they threathend me with forced rehab for oxygen. i thought i might come here and post all of this, in case i dont make it at least there is some record of my life, cause they think im a drug addct and they treat me this way. they brainwashed my father into thinking im mentally ill.
trying to find a human rights lawyer but i cant find one………..
to sum it up…..i have survived now for 34 years like this on my own but now am at the end, i am facing homelessness but this is not an option, oxygen tank to heavy to walk around with and my support animal is pretty much only love i have now. been living in isolation now for a year to protect myself from my sisters and now i am getting close to becoming a statistic. This is terrible. I am so sorry that you are getting no support. While the community can’t offer financial assistance, I encourage you to join the Facebook group for this organization. There are over 9,000 members, and it’s very active – more so than the forums here at this time. There may even be somebody in your area that could point you to a better doctor. Where are you located? You have to answer three simple questions to be admitted. Honestly, I have met some of the most important people in my life through this group. I’ve met a lot of people with CH in person through it too. One of the most comforting things is that feeling of community – knowing that you aren’t the only one who feels this way. I hope you join and engage and find the support you need. Hi kingofpain, please do request to join our private support group as you will find many who understand there. Please hang in there, my friend!